There are three newsletters you can subscribe to if you wish. If you sign up to one you can easily sign up to one or both of the other two by clicking one or two boxes. The newsletters are described below. They are all free. I use what is known as a double opt-in system, which means that when you subscribe you'll receive an email asking you to confirm that you really do wish to do so. If you're interested in hearing about when I'm about to publish a new book, see sample extracts and have the possibility of receiving review copies of new books, but nothing else, subscribe to this newsletter. I will contact you only when I have book-related news. Frequency: Each time I publish a new book. The cover doesn't always look like this, but the contents listed are pretty typical. Formerly called Computers in Classrooms, this newsletter has been published since 2000. 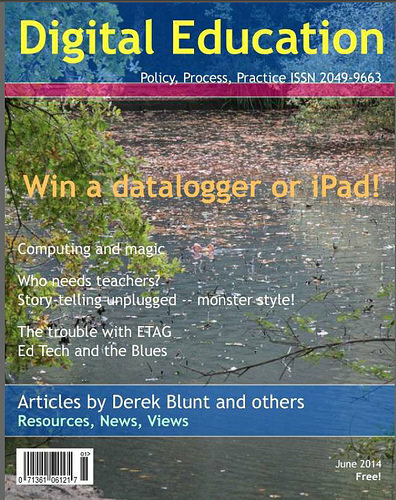 It's for teachers, users, leaders and managers of educational ICT and computing. Join thousands of other subscribers for news, views, competitions, surveys and other good stuff. Still not sure? There's more information here: Digital Education. Frequency: Approximately every 6 weeks, or twice in each school term. Frequency: Difficult to say, as at the time of writing this I haven't published any. Once I get into my stride I hope to publish once a month.